If you have implemented Single Sign-On (or SSO), you may not want the user to login to Salesforce directly. For the simple reason that you want your SSO to be the single place to control user access. So if the employee leaves the company, you just disable them in your SSO system and not worrying about disabling them in various other systems. With SSO, it is also easier to implement and maintain the corporate security policies (like 2FA, password complexity, retries, lockouts etc.) in one single system rather than having to ensure that the different systems adhere to these policies. 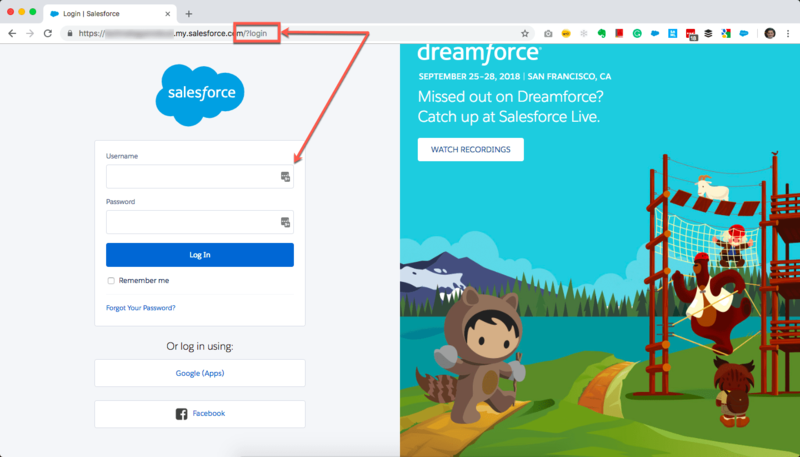 So here is how you can disable direct login to Salesforce. But this is still not foolproof. And that is because if the user is smart, they can simply append “?login” to the My Domain URL and still see the username/password box. Here is how that will look – Oops !! The third step will be to log a ticket with Salesforce support to enable “Delegated Authentication“. 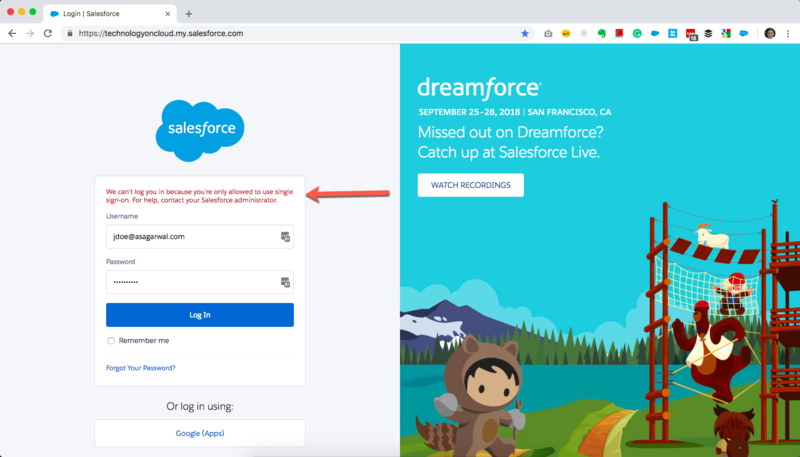 Don’t worry, we are not going to configure delegated authentication or anything, but will leverage on this feature to stop users from logging on to Salesforce directly. 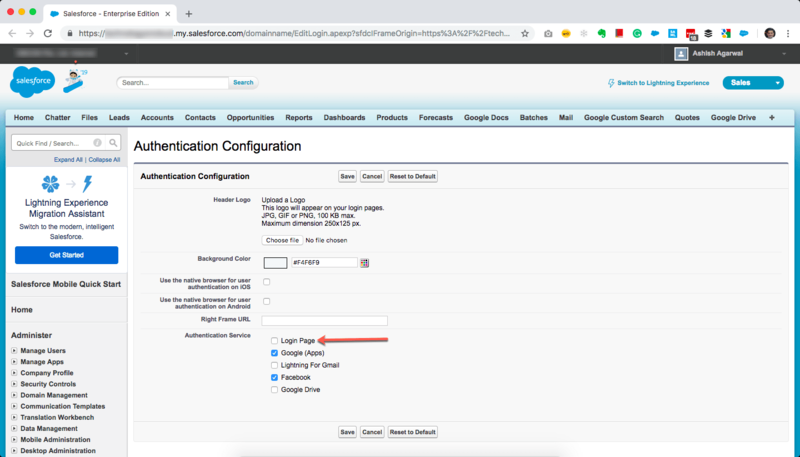 Once Salesforce support enables the delegated authentication in your Org, you can confirm that by navigating to URL Setup -> Single Sign-On settings. If you see the Delegated Authentication as highlighted below, it has been enabled for you. Leave the Delegated Authentication section as-is. Do not specify any values here. 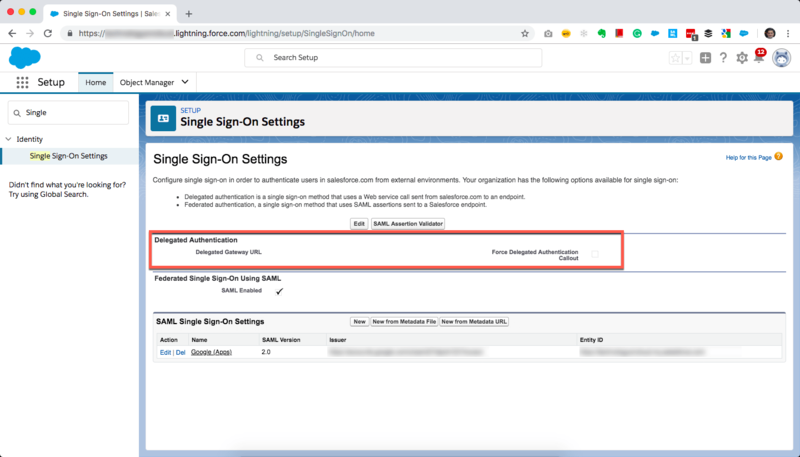 Once Delegated Authentication is enabled in your org, you are going to see a new system permission in profile setup called “Is Single Sign-On Enabled“. You need to check this for the profiles of the users you want to disable direct login to Salesforce. So what we have done is asked Salesforce support to enable ‘Delegated Authentication’ but then did not configure any settings for Delegated Authentication. And then enabled Single Sign-On at the user profile level. The concept of delegated authentication is that once it is enabled for a user’s profile, Salesforce will not check the username and password itself. Rather, it will make a web service call to the Delegated Authentication URL, passing the username and password and if the web service call returns true, the user will be allowed to log in. If it returns false, the user will not be allowed to log in. In our case, we have twisted the delegated authentication feature to disable direct login to Salesforce. Since we did not specify any web service URL, Salesforce will not be able to make a call to anywhere. And since the user profile has single sign-on checked, Salesforce will not verify the username/password itself. The end result is that users will not be able to login to Salesforce directly by providing username and password. Pretty nifty, hah! IMPORTANT: Do not set this option for the System Admin profile. The simple reason that if your SSO system is down or not working for whatever reason, you still would want the administrators to login to Salesforce directly. Do not try out these steps in your Production Org. Always test in a Sandbox or Developer Org first. After enabling Delegated Authentication and ”Is Single Sign-On Enabled” permission on the profile.. will it work without using my domain. Yes, it will. My Domain is not a pre-requisite for this to work.